Dr. Christy is absolutely the correct choice. Maybe the readers of this blog will check out Andy May’s “CLIMATE CATASTROPHE! Science or Science Fiction?”. Andy spells it out with real data in a straight forward manner. It certainly goes along with Dr. Christy’s position on this topic. I hope this trend of placing responsible scientists as advisors to the EPA continues. More to come I hope. The best use of Dr. Christy’s data set is to determine the amount of energy that has been added to the atmosphere since the beginning of the satellite era. Measurements of the ocean temperatures (ARGO and predecessors), ice mass loss (GRACE and predecessors) and land temperatures make it clear that the climate system has absorbed around 275 ZetaJoules since about 1970. Quantum mechanics, spectroscopy, radiation heat transfer make it clear that added CO2 has added well in excess of that amount. The 1st Law of Thermodynamics connects the cause (added heat by greenhouse gases (GHGs)) and the effect (increase in internal energy – warming, melting, evaporation). Energy professionals all understand the First Law and should acknowledge quantum mechanics. Climate has recently warmed, added GHGs did it. 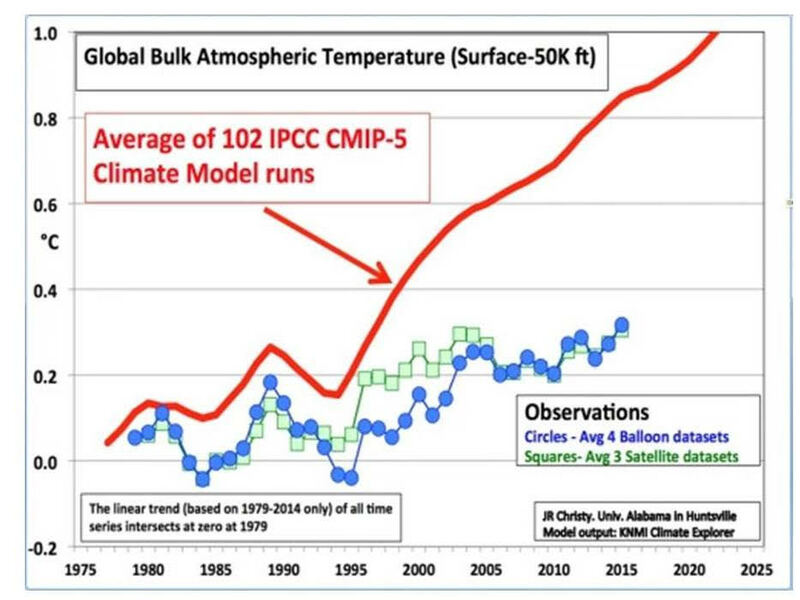 As Dr. Christy says, the satellite data suggest that the CMIP models over predicted tropospheric temperatures. But CMIP nailed ocean temperatures. Over 90% of the heat added by GHGs went into the ocean. It is what matters in terms of energy balance and energy balance rules. Dr. Christy’s objection is interesting but not that important. CMIP have done rather well in surface temperatures when fairly compared with GAST. And, after all, we live on the surface. Drs Christy and Curry made as much hay as possible out of the hiatus, but the hiatus is gone. The models, while still a little warm, are getting the rate of warming pretty well. The year 2100 will be a mess unless GHGs abundances are reduced. It may be hard to see this if your 401k is in carbon. Good points and the basis of discussion. Until the last sentence, good tone too. I will have a post at MasterResource later this week on the ‘missing’ heat (in regard to a lecture I attended by Andy Dessler here in Houston). 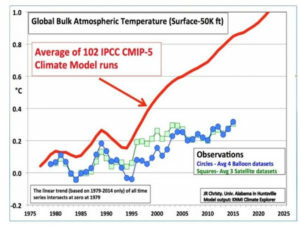 I believe the model-projected warming is for all surface temperature, period. Not what might be stored in the ocean. If the models have underestimated ocean delay, then that is separate from the surface temps as I understand it. But if the energy imbalance is just not as much as thought (climate sensitivity is between 1-2C, let’s say, versus the models at 3C or more), then the “missing warming” is just not there, right?